This is a season of multi-colored lights, of one horse sleighs, a time when rotund Santas listen as excited children recite the lists of what they want for Christmas. It is a magic time when snowmen like Frosty, come to life to our delight. The air is filled with music about coming come for this wondrous Holiday. Much of the celebration has little to do with the first Christmas. Today Christmas is a commercial windfall for so many businesses. Steadily and stealthily we were pushed away from the simple beauty and powerful message of the first Christmas to find ourselves in a stressful financial crunch that urges us to spend, spend, spend. From the mind of the children in our lives to the feelings of significant adults, what we spend is representative of how much we love them. This is not true but the pressure to prove otherwise can push us into a wretched state. We have accepted the commercial version of Christmas so long that we may overlook the true meaning. For certain, the secular offerings are not all bad. There are some good messages and inspiration to to be garnered from observing them but that is also where it gets tricky. When you forget the real thing all you have is the fictional take on the message. Fiction is artificial. The affect is a placebo. As As a child I joined my siblings at the feet of my parents and listened intensely as they read the biblical Christ story. It was easy to see the angels and hear their voices singing "Glory to God in the highest..." How exciting it was to follow along as Joseph and Mary, having found no shelter in the inn, took shelter in a manger. I could see the animals looking on. By the time the wise men arrived with their special gifts, Frankenscence, Gold and Myrrh, I knew something special was happening, something divine. By the time I meditated on the baby wrapped in swaddling clothes, it seemed I could see his eyes. I was transfixed by his peace. He could see and feel me 2000 years into the future but the odd things was that I understood I could see and feel him through time also. There was a pure connection...cellular in nature but most assuredly spiritual. And all this from a child who had not yet spoken a word. Soon the Baby Jesus was targeted for death by the Harrod Regime. You wonder how anyone could feel threatened by the life of a child. Someone knew Baby Jesus could bring down strongholds. Christmas is a celebration of the birth of The Christ Child, simply the spiritual champion of the human race. He was prepared to live a life of ultimate sacrifice so that that he would be empowered to vanquish the foe within. He could go where we could not. We all need a champion. No matter how great you are there is a place you cannot go, an enemy you can not see. He slays babies, he won't hesitate to slay you. 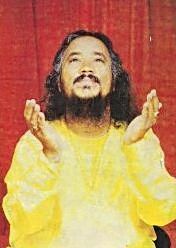 Sadguru Sant Keshavadas in a posture of praise. The commercial Christmas piggy-backs off the gifts the Baby Jesus received in the manager but the wise men gave from their hearts. No one compelled them to give. Their gifts acknowledged a kings born in the lowest of circumstances. That child would one day bring the priceless gift of salvation to all who seek it. Truly, the silent, innocent Baby Jesus was love. Through it all, and there was much suffering to come, he stayed love. This is the spirit we need to embrace on Christmas. Have fun, enjoy your fantasy but embrace the real. There is deep healing to be experienced in the manger. If the Roshi writes like he believes, it is because after 65 years I have no reason to doubt it. Christ is our Christmas present. Receive your gift with praise and thanksgiving.